Dawn Wright (a.k.a. Deepsea Dawn) has immersed herself in two disciplines. She is a geologist who studies the structures along the mid-ocean ridges--the volcanic mountain ranges and sites of seafloor spreading that snake along the bottom of the oceans thousands of meters deep. These mid-ocean ridges are the sites of hydrothermal vents and the unique ecosystems that the vents support. She is also a geographer who specializes in the software oceanographers of all disciplines use to map and analyze the seafloor. Dawn points out features on a map of the seafloor. When in geologist mode, Dawn focuses on cracks (called fissures) that form on the seafloor along these seafloor-spreading centers. These fissures, which range in width from a few inches to several feet, act as passageways beneath the seafloor for magma (molten rock) rising from the mantle and for seawater. Hydrothermal vents are created when seawater percolates down through the cracks in the ocean crust, is heated by magma, then rises back though the cracks to the surface. Therefore fissures provide important clues to the nature of volcanic eruptions and to the birth and death of hydrothermal vents. To learn more about this seafloor "plumbing system", Dawn has studied photos, videos, and sonar images of the seafloor taken by remotely operated vehicles such as ARGO II. She has also descended to the seafloor in the research submarine ALVIN to observe and photograph these fissures firsthand. She is especially interested in the origin of these fissures. One possibility is that the spreading of the tectonic plates stretches the seafloor and opens up cracks. Other cracks might form when magma forces its way up through the crust. Three-dimensional view of the East Pacific Rise spreading center. Colors represent water depths. Blues are deep and yellow/reds are shallow. When in geographer mode, Dawn devotes her expertise to developing better ways of displaying, analyzing, and interpreting information she and other oceanographers collect from the seafloor. She is one of the leading authorities on geographic information systems (GIS). At the most basic level, GIS and similar programs convert data into maps. Yet within these maps, oceanographers can incorporate a wide variety of data. Not only might a GIS map display geological features such as fissures or vents, it might also show variations in water temperature and chemistry, changes in currents, and the distribution of different organisms. Oceanographers can also use GIS to manipulate and analyze a number of data sets simultaneously. A biologist might analyze the relationship between the distribution of organisms and water temperature. Dawn is using GIS to plot the positions of fissures to analyze how their distribution relates to the presence of hydrothermal vents and their associated biological communities. 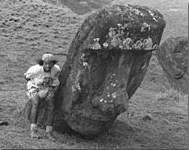 Dawn visits Ahu Tongariki during a research expedition that stops at Easter Island. Although GIS has been used in a wide variety of fields from landscape ecology to archaeology to climatology, it has only recently been adapted for oceanography. Oceanographers study the ocean in three dimensions since they must take depth into account. GIS, however, still has difficulty handling the 3-dimensional data that oceanographers often collect. Dawn writes software that processes these types of oceanographic data and eases transition of these datasets into GIS. Recently Dawn edited a book called Marine and Coastal Geographical Systems. She has also written for the magazine GeoInfo Systems, was chosen as a U.S. Fellow to the International Young Scholar's Summer Institute in Geographic Information in Berlin, Germany, in 1996, and was profiled on Black Entertainment Television's website. Currently she teaches three courses in GIS. Read an interview with Dawn. Get more info on Dawn's background. See images of Dawn at work. See Dawn's typical work week. Other sites related to Dawn's career.